The key components of this stage were to agree on the domains for the measure drawing on the Boardman review into the domains of recovery outcomes (2013), a review of qualitative research into the impact of mental health on the quality of people’s lives (Connell et al, 2013) and further interviews with service users (Connell et al 2013; Connell et al, 2014; Brazier et al, 2014). Items were generated for each theme agreed in stage 1. These items included both positive and negative aspects of the domains. They were developed using transcripts from the work of Connell and colleagues picking out the language used to describe the concepts (Connell et al, 2014) and items from existing measures which among others include WEMWBS, Affectometer 2, CORE-OM, GHQ-28 and other recovery measures. A long list of many hundreds of potential items were reduced by a research team that included service users by applying a list of criteria (including reading age of nine, avoiding value-laden statements, jargon, ambiguity, statements that were too specific to a lifestyle etc). A draft set of items were tested with mental health service users to examine the items face and content validity. This consisted of face to face interviews where users were asked to complete items and taken through a cognitive de-briefing exercise which examined the meaning of the items and the extent to which they seemed to cover the things that mattered in their lives. A sample of clinicians was also asked to review the items. A factor analysis was conducted to confirm the dimensionality of the scales. Item Response Theory analyses were carried out to inform the process of eliminating some items. This stage examined the classical psychometric properties of reliability, validity and responsiveness. Rasch analysis was also undertaken. A comparison of the psychometric properties of the ReQoL items with others including EQ-5D and WEMWBS was also being undertaken. 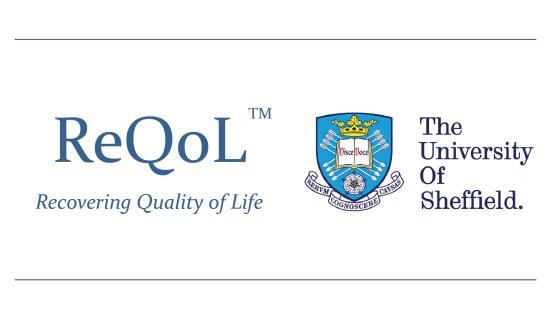 Another use of the ReQoL will be to generate an overall measure of benefit called the Quality Adjusted Life year (QALY) for use in assessing the cost-effectiveness of new interventions in mental health. This requires a method of scoring the measure based on values obtained from the general public in an interview survey. Results will be available early 2017.